After the hard yet highly productive work over the design of the first 4images template, we – the two Themza designers – decided to take a deserved rest. To our deep regret, the summer holiday destination will be neither Paris, nor Palma de Mallorca. We’ll just sit and rest while working. There is no other choice for us at this point. As you may not know, we are working for a small software company and have a very rigorous boss (well, you know, he is like those leaders without a particular qualification but with great organization skills) who would not give us a day off unless we take him to court All our holiday applications keep being rejected. Hopefully, our subordinates will not have the same opinion of us should any of us two become a boss one day. Talking about our boss and our jobs, let us tell you that we take much pride in doing great Joomla, WordPress, Moodle and 4images templates, being as good with our hands as Pablo Picasso was with his. Many designers do not like our websites, but our boss stood up for us, stating that he too does not like the style of Pablo Picasso (his full name is Pablo Diego José Francisco de Paula Juan Nepomuceno María de los Remedios Cipriano de la Santísima Trinidad Martyr Patricio Clito Ruíz y Picasso), but that Picasso is one of the greatest painters of all times. 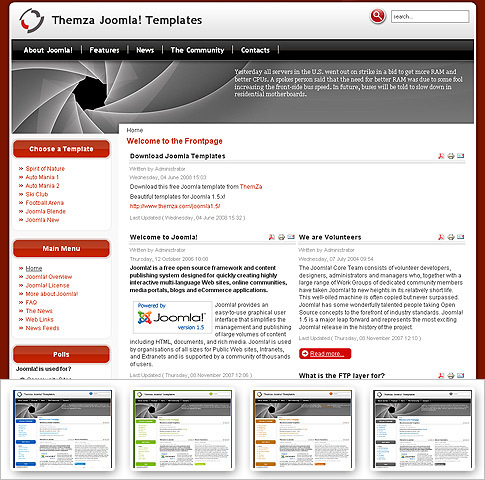 So, while taking a rest from 4image, we decided to make a new Joomla 1.5 template that will be 1024 pxls in width. Making Joomla templates is like a child’s play as compared to elaborating 4images gallery templates. We are not yet clear about the composition and color scheme, but are sure that 100% of our efforts will be focused on the design improvement. We are also planning to make a special Joomla template, based on the Joomla theme that generally goes with the script installation. The Joomla templates distributed online do not cover the whole range of functionalities supported by the script. We’ll definitely need some expertise from my friend programmer Gandalf when we start working on the new Joomla template. To cut the story short, we’d say that a quick Joomla template will be born online between the release of the 4images gallery template and the fully featured Joomla Super Template. It will be a step ahead in the improvement of the design layout style you already know from the Themza templates released so far: Spirit of Nature, Auto Mania 1, Auto mania 2, Football Arena, Ski Club. We’d like to thank all the people who make use of our templates for allowing me to experiment with the layout of their websites. The good news for them is that we are making plans to become much better in our work on the ThemZa templates. Honestly, we dare say that we could become much better in our job, keeping in mind the quality level of the free templates circulating on the Internet. Stay tuned for updates on the progress of our work. This entry was posted on Wednesday, July 30th, 2008 at 6:52 am	and is filed under Joomla 1.5.x. You can follow any responses to this entry through the RSS 2.0 feed. You can leave a response, or trackback from your own site.